Often called the greatest novel ever written, War and Peace is at once a historical war epic, a philosophical study, and a celebration of the Russian spirit. Noted for its mastery of realistic detail and psychological analysis, it follows the metamorphosis of five aristocratic families against the backdrop of the Napoleonic wars. Individual stories interweave as each of Tolstoy’s memorable characters seek fulfillment, fall in love, make mistakes, and become scarred by war in different ways. Out of this complex narrative emerges a profound examination of the individual’s place in the historical process. I clearly see why it is called "the greatest novel ever written"
This is a must read/listen. You know you will always wonder why it is praised if you don't read it, and you will be richly rewarded if you do. There is a reason you may have never heard what War and Peace is about. It follows so many things through the course of the book that it becomes difficult to say it is about something. (I think the good comparison is Infinite Jest - only war and peace has real historic events and the fiction is like Gone with the Wind). It my opinion, it is truly a treasure and the more you live life, the more you can reflect on the truth given by it. That in life "there really is nothing to fear". No matter what hard times come, people can overcome all. And that once someone finds inner peace, they can live and let live and not feel a need to control that which is uncontrollable. Tolstoy also analyzes whether a man like, Napoleon (or any Military/Government leader trying to take over the world), is the sole cause or if it's the nation, or God. 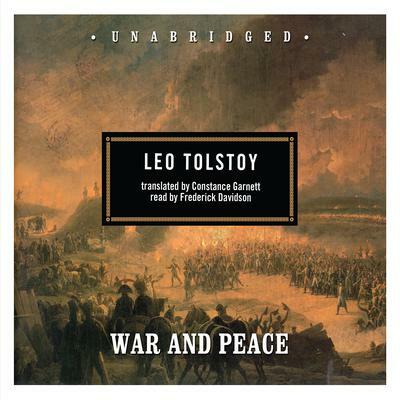 In gradually working my way through ‘the classics’, I at last came to your recording of War and Peace. You cannot possibly imagine my disappointment that this, one of the greatest novels of all time should have been read in such an annoying manner. From the very beginning CD, I found the reader's pronunciation and cadence so irritating that I could not finish even ten minutes of his over-the-top dramatic onslaught! When you have so many fine readers, it remains a mystery to me that this particular work would be given to a person with a need to deliver such an ‘affected’ performance. In giving ‘voice’ to a book, I look for a tonal quality that is 'easy on the ear' and that delivers the story without the need for vocal 'gymnastics'. In this case, we get: simpering, falsetto, smug, and a whole host of other completely annoying sounds that add nothing to the reading except irritation. War and Peace in this instance is a 'war' on the ears with no projected 'peace' for the entire 48 CD set. Perhaps you might consider doing this one over as it needs some restraint in the telling. The narrator's voice was haughty and annoying. "too much uppity" for my taste. I abandoned the experience. Wrong. To begin with, as Tolstoy himself said and much of his contemporary audience agreed, it isn't even a novel. It's part, as Tolstoy put it, an "epic in prose," (back then, when novels were relatively, well, novel, the distinction between them and epics was more widely understood) and part lengthy non-fictional rant. Mixed in with the story are a great many chapters with titles like "The cause of historical events" and "The problem of free will and necessity." There's nothing wrong with addressing such abstract themes, but in a novel they should be presented through the characters and story, not in a separate essay as an aside which, while it may be thematically related, adds little or nothing to the literary merit of the work. It actually detracts from it, as Tolstoy's views and his arguments for them are ridiculously bad. If he stuck to presenting them through the story, one could at least appreciate it as art, though not as philosophy--as one can, for instance, with Anna Karenina, even though its themes are even more monstrous (as it is perhaps the most misanthropic, and especially misogynistic, novel ever written, yet it is "flawless as a work of art," as Dostoevsky said--and Dostoevsky is more humanistic and liberal by comparison, though actually his own views are also pretty medieval). Tolstoy harps on these issues repetitively, seemingly endlessly. So what are its themes? Well, there's the senselessness and inhumanity of war. While that may in fact often be the case, it's not like he's saying something new here, and other writers have presented superior artistic visions on this. Next, he insists that free will is an illusion caused by our ignorance of the relevant causal factors, that men such as Napoleon don't move history (nor do the masses, though Tolstoy believes they have more to do with it) but rather are puppets of History, which basically amounts to God's grand design. It's actually a bit refreshing to see a Christian acknowledge that an omnipotent, all-controlling God is incompatible with free will instead of making tortuous arguments trying to reconcile them, so at least on this point Tolstoy is consistent. However, if you combine the idea that it is not man but God who is in control of man's actions with his first premise about the senseless inhumane brutality of war, the inescapable conclusion is that God is a senseless, inhumane brute. And I don't think that's the view Tolstoy wishes to communicate. Finally, War and Peace is virulently anti-reason and science; as Tolstoy writes, "If we admit that human life can be ruled by reason, the possibility of life is destroyed." In a passage on the kinds of self-assurance of various nationalities, he writes, "A Russian is self-assured just because he knows nothing and does not want to know anything, since he does not believe that anything can be known." (This is said approvingly, as opposed to the German's self-assurance, which is "worst of all, stronger and more repulsive than any other, because he imagines that he knows the truth--science--which he himself has invented but which is for him the absolute truth." The only problem with the Russians is that they should take a more humble attitude instead of being so damned self-assured in their lack of intellectual ambition.) This is especially amusing, however, since Tolstoy tries very hard (though he does so very poorly) to use reason and science and prove his positions. Leaving aside the quality of his ideas and the non-fiction chapters, what about the writing? There are hints of the literary genius (despite their even worse thematic content) of later works such as The Death of Ivan Ilyich and The Kreutzer Sonata, but not very consistently--though it is still far more well-written than most of what's published today. There are a few, but not a great many (considering its length), nice stylistic flourishes, such as this metaphor: "No matter what [Pierre] thought about, he always returned to these same questions which he could not solve and yet could not cease to ask himself. It was as if the thread of the chief screw which held his life together were stripped, so that the screw could not get in or out, but went on turning uselessly in the same place." The story is decent, but it would be easier to get involved in it if any of the characters were actually interesting or sympathetic, but they usually aren't. In short, I'm not sure why this is considered such a great classic, aside from the fact that it is by the author of other, better, works, and that it is so long...which in my view actually isn't a point in its favor, since it could and should have been shorter, which one can not say about other epics such as The Iliad or novels such as The Brothers Karamazov.